Blackbird Pedalboards makes one-of-a-kind pedalboards that are incredibly gig-friendly and bring a level of handcrafted workmanship to any guitar or bass setup. What started in a garage back in 2009 has steadily grown into a company that now stands as one of the leading pedalboard manufacturers in the industry. Each of their pedalboards are made from start to finish with a keen eye on quality, aesthetics and affordability. For Blackbird, balance is always key - they work tirelessly to produce their boards with the highest levels of skill and artistry, all at a price that hard-working musicians can afford! 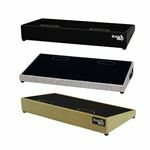 American Musical Supply is excited to be your stop for Blackbird Pedalboards! We offer True 0% interest payment plans – applying is easy and there is no credit check for our 3-pay plan on purchases from $49-1,500. Use your own debit or credit card, enjoy fast and free shipping, and add products from Blackbird Pedalboards to your creative setup. We make buying a Blackbird Pedalboard quick and easy - in-stock items that are ordered before 4PM EST will ship out the same day! Do you have questions about gear from Blackbird Pedalboards and want to know which items would be best for you? Give us a call at 800-319-9043 - our experts are standing by.